Yesterday, we wrote about what Facebook was planning for the next major release of its iPhone app, version 3.0. The big update will contain 15 new features, probably none bigger than the addition of event management to the app, finally. 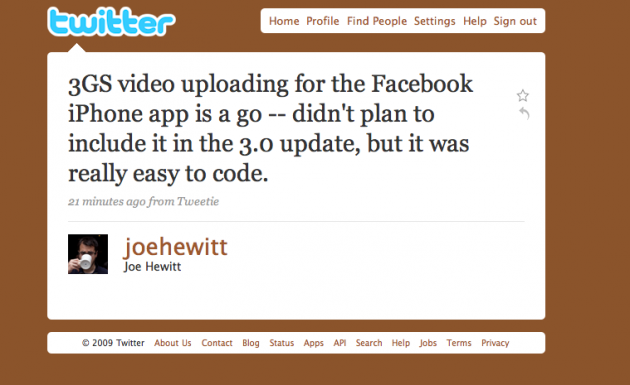 But there was one thing Facebook developer Joe Hewitt didn’t mention yesterday, and it’s a big one: Video uploads from the iPhone 3GS. This is excellent news as it gives iPhone 3GS owners another easy outlet to upload video to. We’ve already detailed how simple it is to upload to YouTube from the device, and how doing so from the new Kyte app gives you great video quality. The iPhone 3GS is simply awesome as a mobile video device, and Facebook is an excellent platform for sharing video amongst friends. Additionally, we’ve heard talk the new iPhone 3.1 beta software which was just released to developers the other day, has some new functionality that should make video uploads even easier. Apparently, the device will be able to change the quality of the video getting uploaded based on your available bandwidth to optimize for the uploads.